Slice the potatoes so each piece is approximately 1/4 inch to 1/2 inch thick. Dice the garlic and onions and mix it with the potatoes. Add the olive oil and mix until all potatoes are coated with olive oil. These potatoes shouldn’t be drenched in olive oil, but if you think you need a little more, go ahead and add some. Don’t get too excited and pour a cup of olive oil on these beauties or you’re going to be draining olive oil from your baking sheet. Let’s all stay calm here. 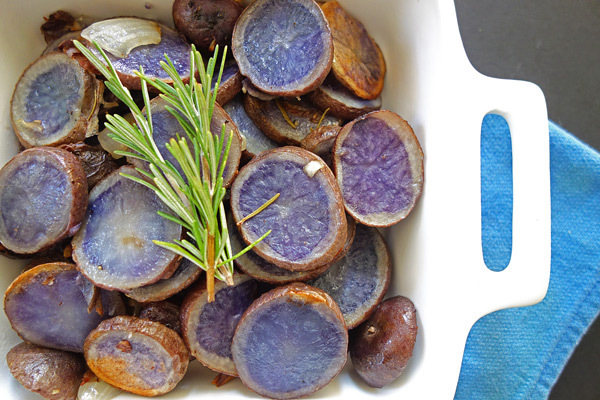 Mix in the rosemary, then spread the potatoes on a foil-lined baking sheet. Roast the potatoes in the preheated oven. Your kitchen is going to smell so good while the rosemary is working its magic. I’m making these again for Thanksgiving this year. You can never have enough potatoes and these not only taste good, but add some more color to your table. Not to mention they’re a little healthier to offset the pies, cheese, and sugar that will inevitably fill the table. I’m not complaining, it’s just a fact. And I love you guys, so I’m here to help. Enjoy! Preheat oven to 375 degrees. Dice onion and garlic and set aside. Rinse potatoes. Slice potatoes in pieces approximately 1/4 or 1/2 inch thick. In a medium bowl, mix the onion, garlic, and potatoes with the olive oil. Add the salt, pepper, and rosemary and mix well. 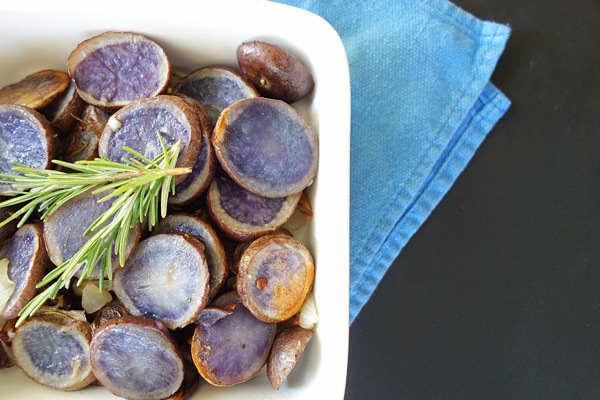 Transfer the potatoes to a foil-lined baking sheet and roast for approximately 45 minutes or until potatoes are soft and begin to brown. Wow! These looks so delicious! Thanks, Reagan! 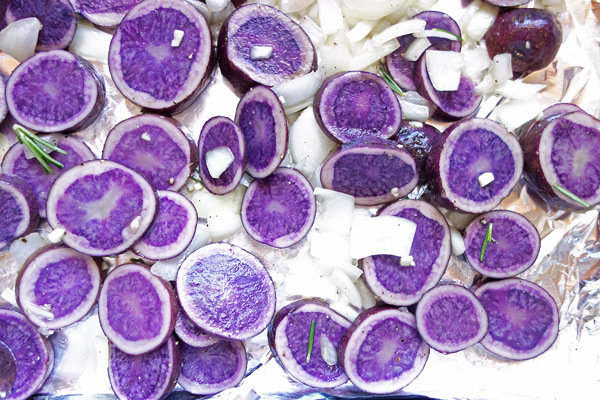 Purple potatoes are so fun to cook with!